Based on the acclaimed book L.A. Noir: The Struggle For The Soul Of America's Most Seductive City by John Buntin and developed for television as a limited dramatic noir series by Frank Darabont, who wrote and directed the pilot that takes the historical context of the book to create a fictional morality play against the historical figures in the series. Following a brief prohibition era prologue, Mob City takes place in 1947 when L.A. was a rapidly expanding boomtown with an ongoing battle between the mob and corrupt police force where more cops are on the take than not and collectively they are all fighting the for the soul of the city. With close attention to historical detail, a jazz filled soundtrack and lots of snappy dialogue that features Darabont's acting alumni that includes Jon Bernthal, Jeffrey DeMunn and Alexa Davalos and also stars Milo Ventimiglia, Neal McDonough, Robert Knepper Ed Burns and a special guest appearance by Simon Pegg, Mob City is slick and cool crime drama action with beautiful ladies and good screen chemistry between cast members chewing up the scenery in what might be the best stylized cops and robbers epic since Michael Mann's Crime Story back in the mid 1980s and that series was set at a time after this show. All journalists have been asked kindly not to reveal too many story details and avoid spoilers so I am going to cut it off here. 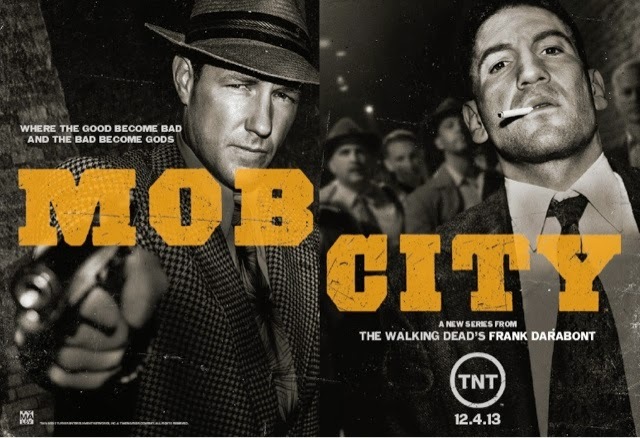 Mob City will debut with two back to back episodes on Wednesday, December 4, 2013 beginning at 9pm (ET/PT)/8pm (CT) and will continue with two more two hour blocks on December 11 and 18 on TNT.